Welcome to the historic Fuller Cottage! 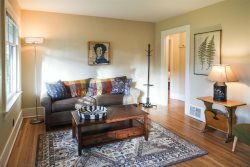 Located on Delaware Avenue in the heart of Bend, you can WALK or BIKE EVERYWHERE from this great location. This bright and sunny treasure in the historic district has been lovingly renovated creating an open living space with fabulous finishes, upscale furnishings, and all of the modern amenities. Gather ‘round the gorgeous quartz kitchen island for a gourmet meal, cozy up to the gas fire stove and watch a movie on the giant Smart HDTV, or play games with family and friends. Grill and dine outside and play outdoor games in the large back yard. End your day with a soak in the hot tub under a Central Oregon sky filled with stars, and sleep well on high quality mattresses with gorgeous European style bedding and luxury linens. Exploring Bend you can walk to the Box Factory district, downtown, and to the Old Mill. Get your Bend Ale Trail passport stamped at Crux Brewery or enjoy a cider at Atlas Cider Company. Jackson’s corner (the locals’ fave) is just down the street as well as many other fun shops, restaurants, breweries, and coffee. Built during Bend’s mill town heyday by Chester and Mathilda Fuller, this historic treasure is filled with modern day Bend charm and character and creates the perfect setting for lasting memories to be made! 3 bedrooms and 1 bath sleeps up to 6 guests. • Great location WALK EVERYWHERE!